Lawrence Matt, MD (Santa Monica) - Book Appointment Online! 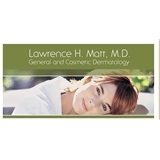 Located in a comfortable, state-of-the-art office in Santa Monica, California, Dr. Lawrence H. Matt provides a full range of cosmetic and medical dermatological services to help you look and feel your best. Dr. Matt and his staff work individually with each patient to design personalized skin care treatments. Dr. Matt treats chronic skin conditions such as eczema, psoriasis, and rosacea, as well as acne, age spots/brown spots, cysts, skin cancers, and skin discolorations. We offer a wide array of procedures, including Skin Titan™, Sculptra™, Radiesse™, chemical peels, laser hair removal, sclerotherapy, BOTOX®, Dysport®, Juvederm, Restylane®, Voluma, Volbella, Kybella and Latisse. I thought that Dr. Matt and his entire office were very nice and cordial. The wait time is very quick, I hardly waited more than 5 minutes. He was very attentive to all of my questions, listened to all of my concerns, and I’ve felt very happy every time I’ve left his office. They removed a cyst that I had For years and have had multiple practitioners just move right past it. Very happy.